1. Boil the drumsticks in 2 to 4 cups of water. 2. Retain 1 cup of water. 4. Fry onions till golden. 5. Add potatoes, tomatoes, turmeric, red chilli, coriander and cumin powders. 7. Add the drumsticks along with the retained 1 cup water. 8. Boil for 8 to 10 minutes over medium heat. 10. Add green chillies, coriander leaves, coconut milk and let it simmer for a few minutes. 11. Add the lime juice and remove. 12. Serve hot with roti or rice. 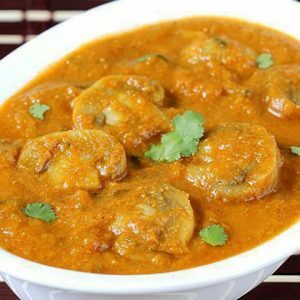 Feel free to comment or share your thoughts on this Andhra Drumstick Curry Recipe from Awesome Cuisine.